One quick look at my yard is all it takes to conclude that I am not a lawn fanatic. As long as it’s green I don’t really care if much of the color is provided by weeds. I’d rather spend my time on the flowers and vegetables than on cultivating a carpet of clover-free grass. So you might wonder why I’ve spent time each morning and evening for the last week scanning my yard for the telltale seed heads of the dandelion, trying to catch them before they open into a full sphere when the individual seeds will catch the slightest breeze. It began on a whim, when I recalled a scene many years ago of my elderly neighbor picking dandelions along the street across from her house. She told me that picking the seeds would stop them from flying across the street to her lawn. If I could stop the seeds from spreading, I wondered, could I slow the proliferation of dandelions in the yard? I know that trying to dig up dandelions is an exercise in futility, and I’m totally opposed to using toxic chemicals that run off and pollute the Sound. But could I make my lawn a little less weedy and still be kind to the environment? At first, I’d just pick the nascent seed heads in the morning, when I came back from the gym and walked around the yard to determine what I would do after the dew dried and it warmed up a bit. Then I realized the dandelions that had not even a hint of a seed head the day before had already dispersed their seeds by the following day. So I began the twice daily routine — and I decided to research the lifecycle of dandelions to find out why the seeds seemed to develop overnight. Dandelions close at night, and like all plants they may not obtain energy during the day, but they are busy using up stored energy. It seems likely that the final stages before the “clock” emerges will take place while the flower is closed… then it will open when the sun is strong enough to dry the papus (thus opening each parachute) and the seeds can disperse. This reliance on the sun means that the flower will stay shut on rainy days when the seeds would be less likely to disperse. In other words, these are pretty smart plants. 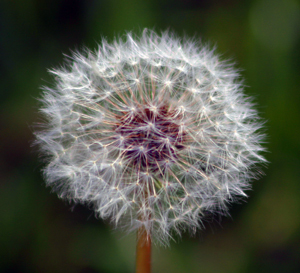 David Beaulieu, who writes the About.com guide to landscaping, suggests that at a minimum we should tolerate dandelions and their attractive yellow flowers. And a more radical approach, he suggests, is to “eat your weed problems away.” After all, all the parts of the dandelion are edible, according to Mr. Bealieu. The roots, he writes, can be roasted as a coffee-substitute. Dandelion greens can be boiled like spinach, or used as salad greens with a bite. And the flowers, as fans of Ray Bradbury will remember, can be made into wine. Sounds interesting, but not an approach I’m going to follow. Think I’ll just keep picking the seeds as they pop up and seeing the bright yellow spots on the lawn as a bit of sunshine. This article first appeared on Emily Grotta’s blog, Larchmont Musings.